The STIGA table tennis rackets are a great brand name in the table tennis community. This STIGA Classic Table Tennis Set is very well made and also durable in nature. They come in several colors and styles to suit the needs of the avid gamer. It is not a surprise that a lot of ping pong enthusiasts are so inclined to have this brand of equipment and accessories for playing this game. So if you are looking for your ping pong accessories and equipment, a great option is to look for STIGA table tennis rackets or paddles. You can choose either 4-Player set or 2-Player set. 4-Player set is manned for the double game and 2-Player is manned for the single game. If you buy this STIGA Performance 4-Player Table Tennis Set, you will be able to play a doubles match right away with your friends or family members. The set comes with 4 paddles and 6 ping pong balls. The paddle is featured with 1.0mm rubber sponge, 5-ply construction, and a concave handle. While the balls are having a size of 40mm in diameter with 3-star rating which is good and decent to be used for official competition. The blade can fit nicely in your hand if you get a hold on it. You can play the ping pong game anywhere with this table tennis set. What you need to do is simply set the post on the table, grab your rackets serve up with the included balls, and let your body fly. The rackets are made for compact storage. It has a smooth rubber to provide good spin on the ball that you play on. Also, it features a pips-in surface where the pips are inverted so that you can have better control and spin. The can make your playing stroke to be more powerful to compete with your opponent. The edge on the paddle is providing good protection for the rubber against ripping off. And, with the combination of bi-injection, it is ready to provide a sturdy and compact feel to the bat, which is a technology that STIGA always renowned for. Generally, this table tennis set can provide you will a lot of fun playing the game of ping pong. It gives you some quality play with good speed, spin, and control. 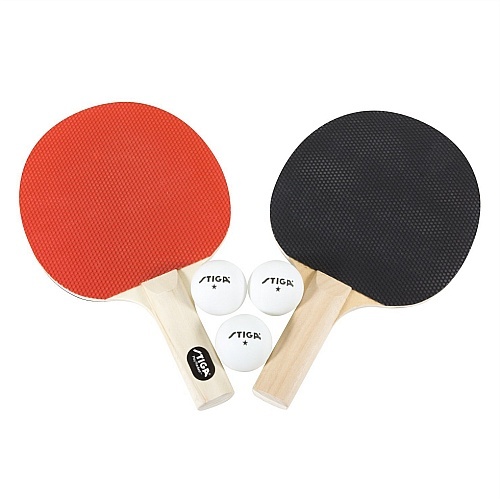 If we take a look at the price, it is very affordable compared to other similar range ping pong sets. Thus, it is a rather safe purchase for you in case you are just on your way in finding for a decent paddle sets to play ping pong for fun. You can get this set from Amazon. The racket is having pimples in rubbers for both sides. The color of the rubbers is red on one side and black on another side. This is the standard color for table tennis. The overall performance of the racket is excellent. It can offer you with decent speed, spin and control. There are 3 balls come with this set and the ball is of 1-star. The set is suitable for beginners and amateur players. You can buy this set from Amazon. You can get this table tennis set from Amazon. 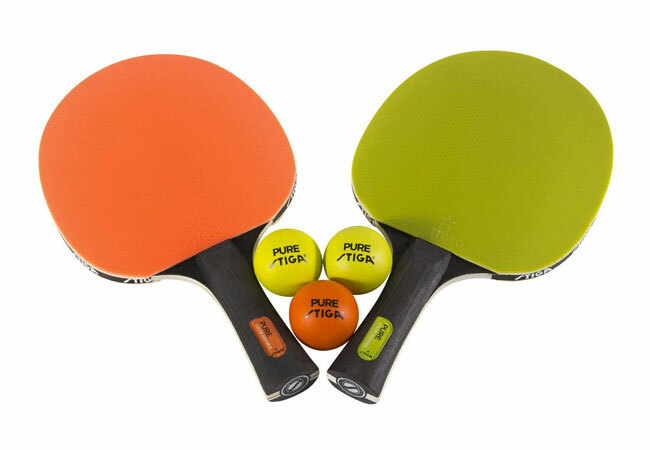 STIGA Pure is a performance paddles series with added flare. The paddles are constructed with ACS Technology which can offer players with superb control. The paddle is attached with orange and green rubbers which make it a very colorful paddle. 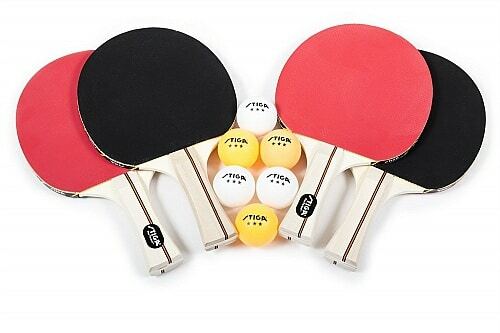 If you want some colorful paddles and balls that is different from the standard one, you can get this STIGA Pure Color Advance 2-Player Table Tennis Set. They are available at Amazon. 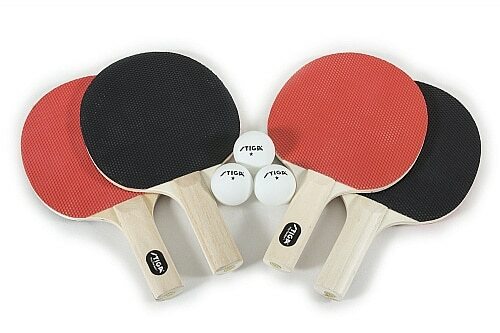 You can play the game of ping pong with this STIGA 2-Player Classic table tennis set. It can be perfect equipment for recreational players to enjoy playing and have some sport exercise to stay healthy. When it comes to playing ping pong, some people take it very seriously and there are even Olympic sports in which participants play this game. When playing the game, it is of the utmost importance to have a paddle that suits the needs of the player. These STIGA table tennis rackets are made from the best quality wood and use the highest quality rubber to ensure that they will last for a long time. Some of them are even recommended for tournament play, but they are also sold for the rookie players as well. These rackets can be purchased alone or in sets and can also come with a great sleek looking cover to complete the look. Depending on the racket, they range in price from around ten dollars to in the upper hundred dollars. Professional ping pong players insist on a great well handling racket to complete any competition. Overall, the STIGA table tennis rackets are a great addition to any table and can be used by the most novice player, to the highest competitors. Having a table tennis table in the home is a wonderful way to increase your skills. If competing professionally is a goal, having an in-home table with the proper rackets is a must. Some would not look for a STIGA table tennis rackets because of the price but if you intend on having it for the long haul, then you should consider otherwise. This can be a fun game of skill played in large groups or just family game night. No matter what the skill level, its fun for everyone involved and does not take much effort to learn to play this simple and easy yet fun and entertaining game. Whether daily, weekly, or monthly, this is a game enjoyed by most who have tried it. And the obvious choice if you want a long lasting investment on your table tennis equipment, like pads and ping pong racquets, STIGA table tennis rackets is a great choice.